July 13, 2004 Las Vegas, Nevada – A month ago on June 12, 2004, I reported an update for Earthfiles and Coast to Coast AM with George Noory about alleged government whistleblower and microbiologist, Dan Burisch. 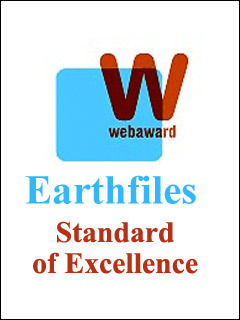 See: 06/12/04 Earthfiles and 05/19/04 Earthfiles. His Ph.D. allegedly was earned at State University of New York, Stonybrook (SUNY) in the 1986 to 1989 time period and paid for by the government, but no diploma or university confirmation has yet been provided. Bill Hamilton, former Executive Director of Skywatch International and computer programmer at UCLA, had been investigating the Dan Burisch case since Bill first met Burisch in April 2002. Bill had twice videotaped Dan Burisch describing his alleged 1991 to 1994 microbiology work with a non-human entity called “J-Rod” at S-4/5, Area 51, Nellis AFB. The first taping was in September 2002 with Dan, his friend Marcia McDowell and Bill. The second taping was on June 7, 2003. Then Bill was joined by five other men who all had video cameras. For the June 12, 2004 news updates, Bill Hamilton had given me permission to use audio excerpts from the 2003 interview. I also played excerpts from an interview with Dan Burisch which I had videotaped in Las Vegas on May 30, 2004, when he showed several of us the Vishnu Schist Great Unconformity at Frenchman Mountain east of Las Vegas. 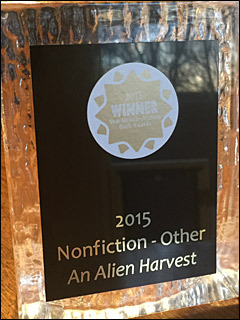 There, he said, he had been researching panspermia, a life seeding process he thinks he has found. Dan also discussed an alleged timeline anomaly he says is affecting the J-Rod entities and could affect this planet’s future. 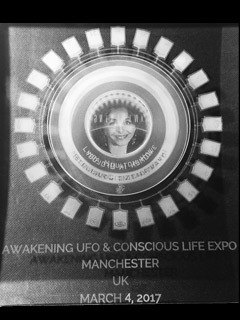 Two weeks later, George Noory followed up with a UFO Magazine challenge to Dan Burisch calling for him to take a formal lie detector test on the record. 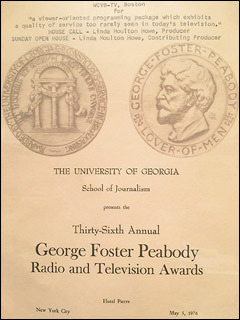 A reporter in Atlanta named Jarred Schenke was listening. He thought the Burisch story reminded him of a 1989 book he once read entitled Nighteyes by Garfield Reeves-Stevens, a writer for Star Trek who also wrote Dreamland, first published in Canada in 1985. Jarred then searched the name Dan Burisch. 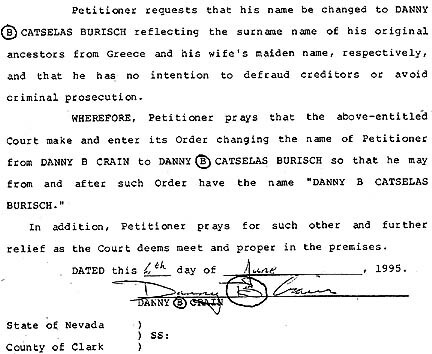 What came up was a Chapter 7 filing in the United States Bankruptcy Court in the District of Nevada signed by Danny B Burisch (aka Danny B Crain), his wife Deborah Burisch and their attorney, Frank Sorrentino, on July 16, 2002. The middle initial “B” on Dan’s Los Angeles, California February 2, 1964, birth certificate has no period, a detail desired by his mother, Dodie Crain. 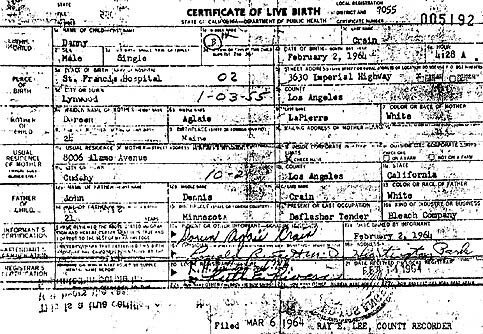 Copy of Danny B Crain’s February 2, 1964, birth certificate from County Recorder of Los Angeles, California, provided by his mother, Doreen (“Dodie”) Crain on which she circled the middle initial “B” without a period, indicating that was a detail she requested. 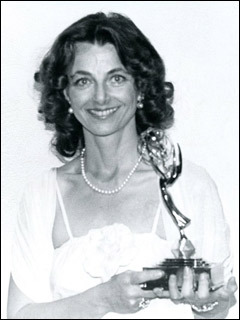 Dan had told Bill Hamilton that his wife, Deborah, also worked with him in his classified government project, but she had a “cover job” in a Las Vegas casino. How could these two people be filing Chapter 7 bankruptcy on July 16, 2002, and simultaneously be working for a classified U. S. government project? In 1975 at age eleven, Danny Crain was the youngest member of the Microscopical Society of Southern California where he joined at Long Beach Memorial Laboratory in Orange County. 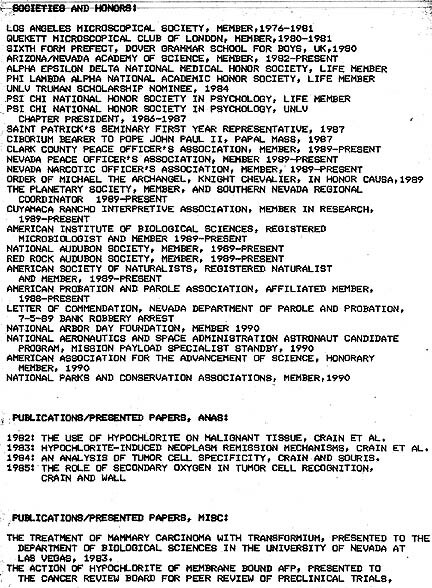 The current president, Jim Solliday, and another former president from the 1970s to 1980s who does not want to comment on the record, confirm the “youngest member” distinction and say the teenage Danny Crain was thought to have great scientific promise fueled by Danny’s desire to find a cure for cancer. The young Crain was considered gifted enough to be placed under the mentorship of a prominent veterinarian in London until an unexplained falling out in which the doctor asked Danny Crain to leave. Whatever happened, Dan’s mother, Dodie, gave Bill Hamilton a transcript of Danny Crain grades at the Dover Grammar School for Boys, Dover, England, dated September 1980. 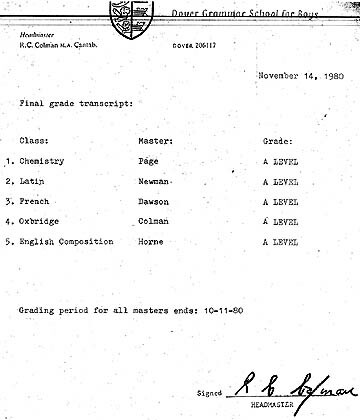 Above: November 14, 1980, “A Level” grades for Danny Crain, Dover Grammar School for Boys. 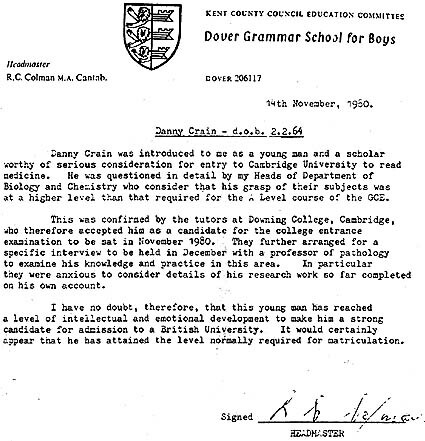 Below: November 1980 letter of recommendation about Danny Crain for “entry to Cambridge University to read medicine,” from Dover Grammar School for Boys Headmaster, R. C. Colman. Documents provided by Dodie Crain. Marcia McDowell said, “Dan has not worked for the U. S. government like people think of a government scientist. There are no paychecks involved, no 401-K’s and matching funds and retirement. There is nothing like that. He works for Majestic-12 (MJ). Chapter 7 bankruptcy was signed on July 16, 2002, and received and filed with the United States Bankruptcy Court on July 19, 2002. This is a public record. 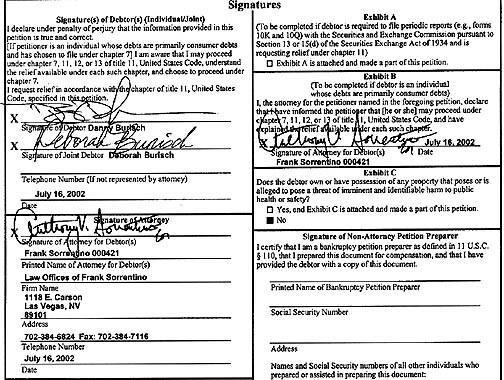 In the Chapter 7 bankruptcy filing, Danny Burisch is listed as “Homemaker” and Deborah Burisch is listed as “PBX Operator” at the Mirage casino for 12 years in July 2002, or fourteen years by July 2004. 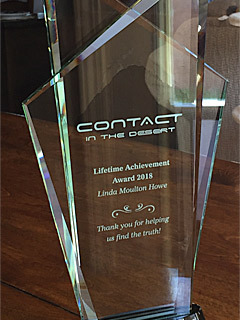 The employment of Danny Burisch, Debtor, is listed as “Homemaker” and the employment of his spouse, Deborah Burisch, is listed as “PBX Supervisor, Mirage Hotel” for 12 years in Las Vegas. A summary of both Husband and Wife incomes between 2000 and 2002 are listed below. There are two categories of “Income from employment or operation of business” and “Income other than from employment or operation of business.” The latter is answered “None” by blackened box. Among other unpaid bills are $8,000 for federal taxes from 1996 to 1998 and $4,507 for medical bills, many related to cardiac issues. Total liabilities are listed as $51,256.00 against assets of $344.02 and one 1997 Suzuki car on which loan payments were still being made. The last half of 1999, Dan, Deborah and Deborah Burisch’s parents lived together in an Ocean Springs, Mississippi apartment near Biloxi. By 2000, Dan and Deborah Burisch were back in Las Vegas, Nevada. According to reporter, Jarred Schenke, this lawsuit took place in the last six months of 1999 and involved unpaid rent. Marcia McDowell says it was “a single family house.” Ocean Springs is in the Biloxi, Mississippi region which has gambling casinos like Las Vegas. Burisch’s friend and casino co-worker, Marcia McDowell, had published a book entitled Signature Bets, “one of the first surveillance books ever to detail what the House is looking for when it suspects a player has found a Biased Wheel.” McDowell had also written and self-published Eagles Disobey in 1998 about Dan Burisch’s alleged Mars research. 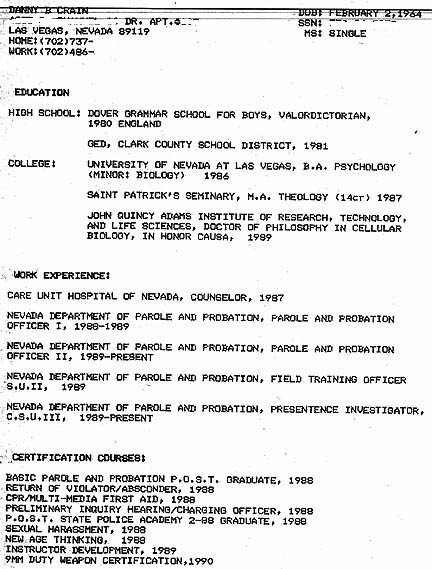 (See Publications in Danny Crain 1991 Resume under More Information below.) Marcia says it was the U. S. government that moved Dan, Deborah and Deborah’s parents to Mississippi because Burisch was becoming more rebellious and whistleblowing about his microbiology work for the U. S. government’s MJ-12. Marcia says the family fought with each other and eventually at the beginning of 2000, were moved back to Las Vegas. Two and a half years later, the Chapter 7 bankruptcy was filed. Bill Hamilton told me he had never seen the Chapter 7 bankruptcy filing before and agreed it would seem to contradict the Burisch claim that both Dan and Deborah worked for the federal government. But Bill said he thought that Dan had mentioned a bankruptcy back in 2002. Allegedly, Deborah Burisch handled finances while Dan did science. Reporter Jarred Schenke phoned Deborah Burisch at the Mirage casino in Las Vegas on June 30, 2004, to ask her about the 2002 Chapter 7 bankruptcy filing. Her only comment was: “Don’t ever call me at work again.” And hung up. In April 2002, then Executive Director of Skywatch International and computer programmer Bill Hamilton, first met Danny B (Crain) Burisch and Marcia McDowell in a Las Vegas library. The meeting was arranged by McDowell after Bill Hamilton emailed her concerning a “Q-94” document she had posted at her Eagles Disobey website. In April 2002, Dan Burisch told Bill he was a microbiologist who had worked for the U. S. government’s MJ-12 and MAJI Committee since recruitment in 1986 by Naval Intelligence while he was completing his Bachelor’s Degrees in Psychology at the University of Las Vegas in Nevada. There are no military records for Danny B Crain or Danny B Catselas Burisch and Dan explained he was never inducted in any military unit. But in his secret work as a government microbiologist, he said he would sometimes be asked to wear military uniforms for formal meetings. 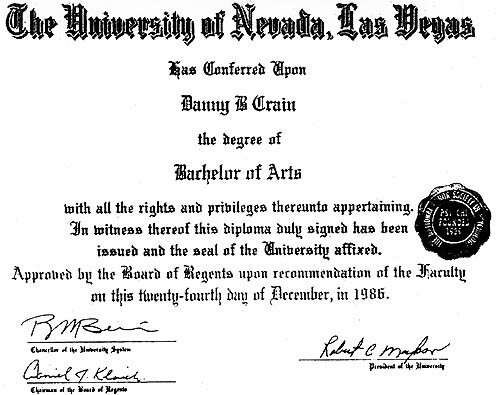 Danny B Crain graduated with a B. A. in Psychology from the University of Las Vegas, Nevada, in December 1986. According to Dan and Marcia, Psychology was a secondary option after he quarreled with his Biology Department’s head over research work allegedly of interest to the National Cancer Institute (NCI). In 1986, Dan Burisch said he was approached by the U. S. Navy to work for them and that the government paid for him as Danny B Crain to go on with his Ph.D. work in Microbiology and Molecular Genetics at State University of New York (SUNY) ­ Stonybrook. 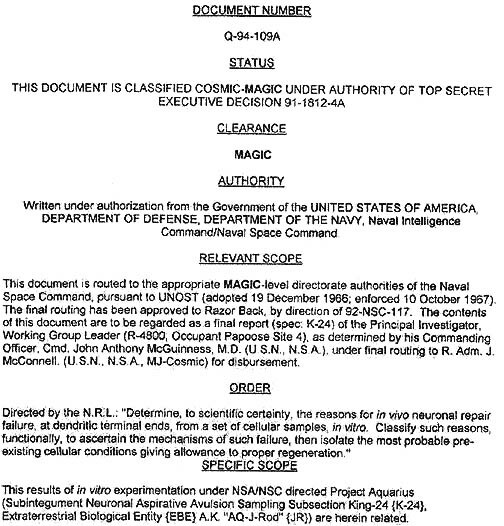 According to Dan, no one can have access to his SUNY records because the Majestic-12 demands secrecy in the interest of classified projects and national security. Bill Hamilton says a man who did not want to speak on the record remembered Danny Crain in biology courses at SUNY. But television reporter, George Knapp, says he first received correspondence from Danny Crain back in the late 1980s about computer systems functioning through biological neuronal tissue, but has never been able to find a professor or anyone at SUNY that remembers a Ph.D. student named Danny Crain. 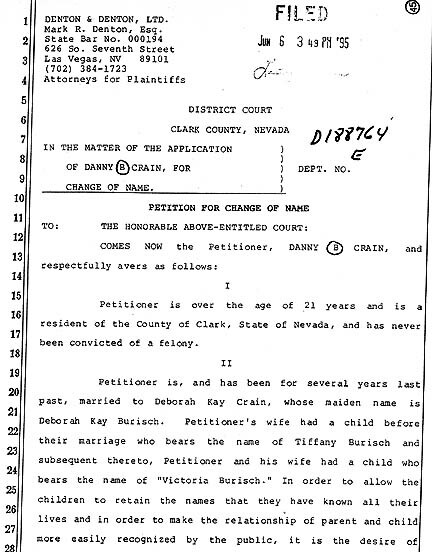 Danny B Crain married Deborah Kay Burisch on July 17, 1990, in Las Vegas. Dan Crain met Deborah while working as a parole officer in Las Vegas. She had a one-year-old child named Tiffany born in 1989 without marriage. In 1995, Dan legally changed his last name from Crain to Burisch “to match the child’s and Deborah’s last name,” he said. Deborah Burisch did not want to change her maiden name. 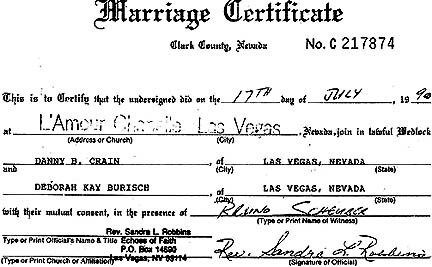 July 17, 1990, Marriage Certificate for Danny B Crain and Deborah Kay Burisch in Las Vegas, Clark County, Nevada. 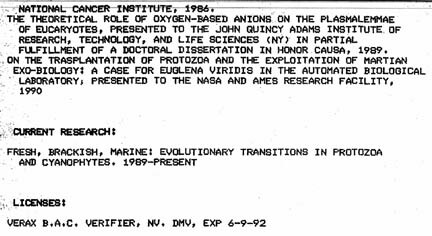 In the early 1990s, Burisch as Danny Crain said he worked both public “cover jobs” and at S-4/Area 51, Nellis AFB, on classified projects related to “J-Rod” extraterrestrial time travelers and panspermia research. Bill understood that Dan Burisch continued to work for the U. S. government through the 1990s and up to his alleged retirement on June 8, 2004. Bill Hamilton also understood that Deborah Burisch worked for the U. S. government as Dan’s government “handler,” a person assigned to monitor Burisch’s microbiology work, while maintaining her “cover job” as PBX Operator at the Mirage casino. 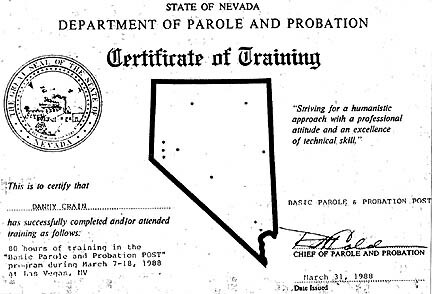 March 31, 1988 State of Nevada Department of Parole and Probation Certificate of Training to Danny Crain, one of several he received during 1988 to 1989. 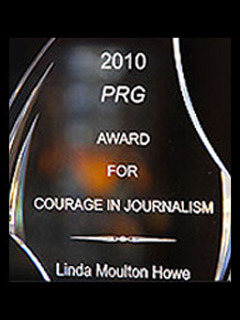 By September 2002, Marcia McDowell (“B. J. Wolf”) and Dan Burisch arranged another Las Vegas library meeting in which Bill Hamilton was allowed to videotape Dr. Burisch as a frustrated “whistleblower.” See 09-15-03 Earthfiles. A few weeks later in December 2002, Dan Burisch was allegedly beaten up in retaliation for his whistleblowing. Marcia McDowell had already moved to Canada, she said, to escape people who were threatening her because she was trying to help Burisch. Bill Hamilton received an e-mail that Dan Burisch had died and posted the notice at his Skywatch International website. Then in Spring 2003, Dan Burisch re-surfaced alive and claimed he was in a kind of “house arrest” situation in which he was forced to do microbiology work for the MJ-12 MAJI Committee. Marcia McDowell returned to Las Vegas from Canada with her mother ill with Alzheimer’s disease and moved into a house where the two have lived for the past year. McDowell told Bill Hamilton she was given an offer by the MJ-12 group to work on the “inside” with Dan Burisch on his panspermia research at the Vishnu Schist Great Unconformity on the eastern outskirts of Las Vegas and that she and her mother would “be taken care of” in exchange for her work ­ but she would not receive a routine paycheck because MJ-12 does not want paper trails. By June 7, 2003, McDowell had arranged another meeting in Las Vegas in which Bill Hamilton and five other people with video cameras were given permission to videotape microbiologist Dan Burisch speaking on the record as a government microbiologist whistleblower. 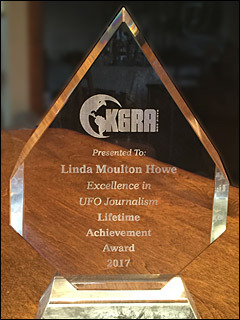 A year later on Memorial Day weekend 2004 at Idaho MUFON Ike Bishops’ Rachel, Nevada UFO camp out conference, Dan Burisch and Marcia McDowell showed up Sunday morning, May 30. Dan told us he had negotiated an agreement with his government handlers to retire as of June 8, 2004, and would not be making any more public statements after that date. A week and a half later, on June 12, 2004, I reported about the Vishnu Schist field trip and audio excerpts from the June 7, 2003, videotape at Earthfiles.com and on Coast to Coast AM with George Noory. By the third week in June, Atlanta reporter Jarred Schenke had contacted me and others about the Chapter 7 bankruptcy. This agency was separated from the rest of the government over 40 years ago. Thus, it would have had an opportunity to evolve in its own way, adapting to the unique requirements of the subject matter. ‘The organization is largely composed of older men who have worked with each other for decades. A worker’s supervisor and his security officer are assigned to him for life. ‘The organization is extremely hierarchical, especially given the needs of compartmentalization. A worker reports only to his immediate supervisor, and direct contacts with members of other departments and higher management are rare. “People like myself, we signed away our constitutional rights at the time (we joined the program). We took the secrecy oaths and signed those documents. We basically worked under a dictatorship, but a benevolent dictatorship. But I want to say this: I enjoyed myself, had no problems. As a matter of fact I just enjoyed my work. As far as dictators, we were told what to do and we were good boys. Nothing went wrong. Note from Bill Hamilton about John Quincy Adams Institute referenced under “College.” Bill says that Marcia McDowell told him that MJ-12 substituted this school name to cover-up Dan’s State University of New York at Stonybrook (SUNY) attendance where Danny Crain allegedly did Ph.D. work in Microbiology and Molecular Genetics paid for by the government. But it’s not clear why SUNY itself should not be straightforwardly acknowledged, if a legitimate degree was earned there. It’s also not clear why such a Ph.D. diploma is not forthcoming from either Dan Burisch or his alleged government handlers if his credibility as a microbiologist with advanced training is now questioned.